¡Feliz Cinco de Mayo amigos! 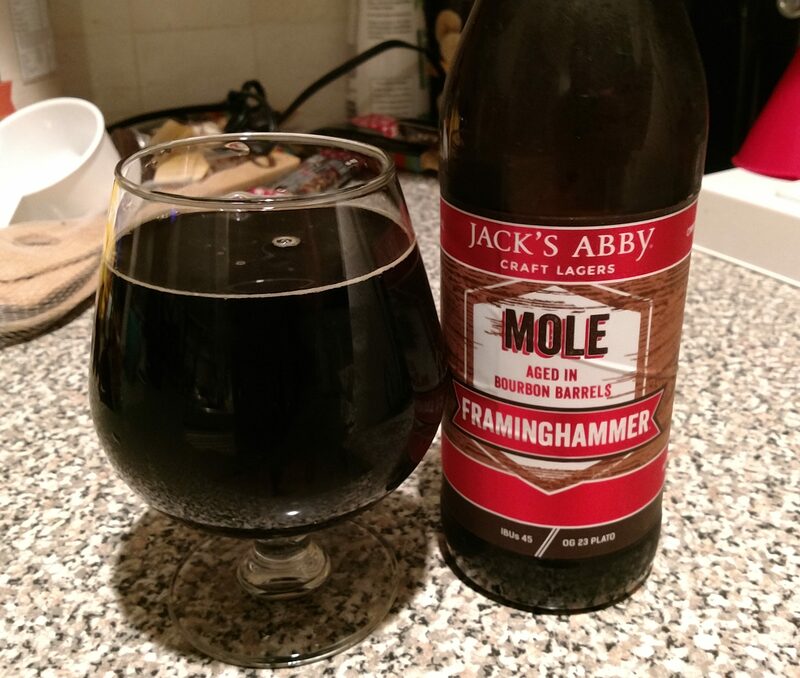 I’m celebrating tonight with a beer from local favorite Jack’s Abby that drew its inspiration from a delicious Mexican sauce. 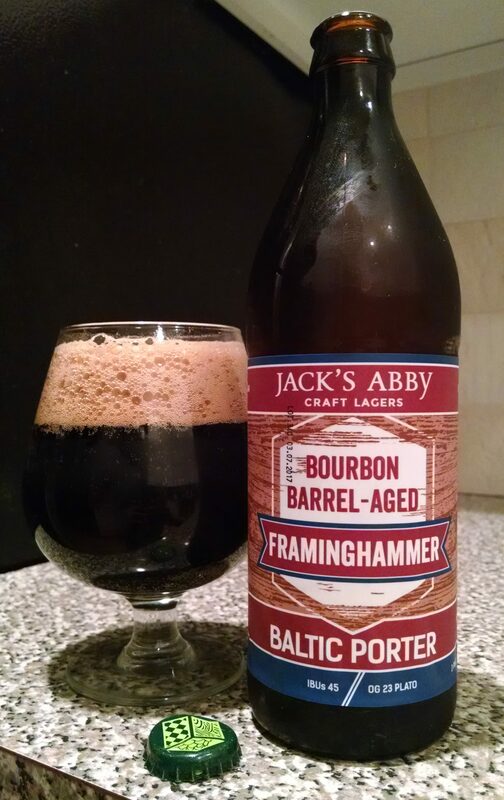 Description: A variant of the brewery’s popular Framinghammer porter aged in bourbon barrels with cocoa nibs, chili peppers, and cinnamon sticks. Read about how it all comes together here. Appearance: Poured a thick dark cola brown/black body with a minimal amount of fizzly tan lacing around the edges. Taste: Creamy chocolate and sweet dark malts upfront were joined mid-sip by rich grains and a hint of cinnamon. Finish is warming in more ways than one with chili peppers blending in boozy bourbon barrels influences. Mouthfeel: Slick, full body with minimal carbonation. Hype: Framinghammer and its variants are all well-respected, sought after brews but hype isn’t necessarily the right word here. Jack’s Abby has sufficiently upped its production and distribution to the point that anyone who wants these can get them without lining up or having to put in a lot of legwork. The bottles don’t sit on shelves long, but they are readily attainable (at least in my area). 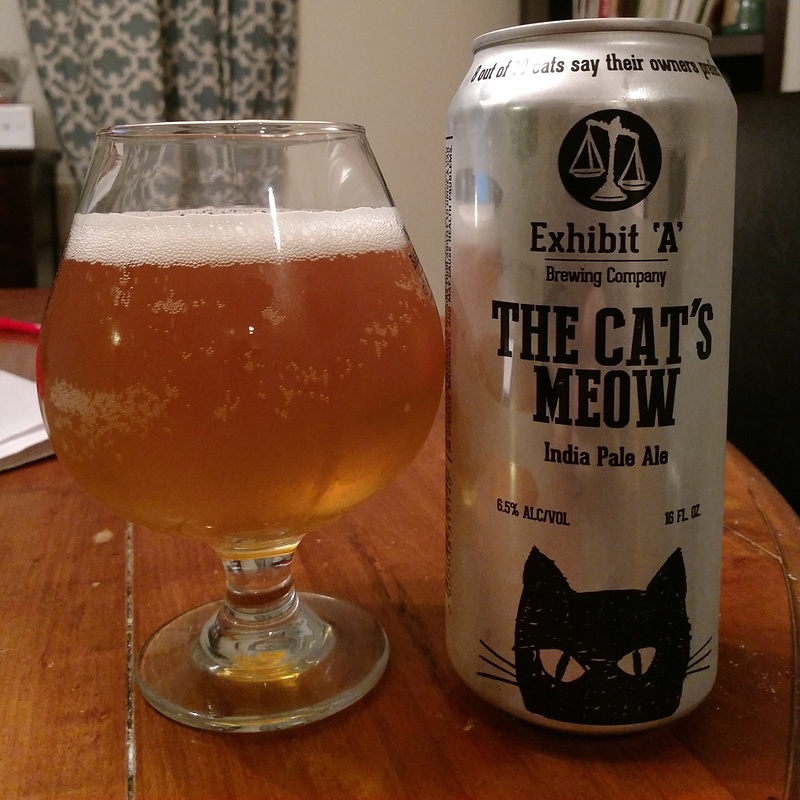 Overall: The brewers hit their mark on this one a delivered a beer that clearly brings to mind the food that inspired it. I don’t think this is something I would want all the time but would consider it again as a novelty dessert beverage. The chocolate notes stood out nicely against the heat in the finish and the interplay between the different components kept me going back for more. Best you enjoy this one slowly (and, of course, responsibly). It seems fitting that I begin my October celebration with a Marzen style beer. 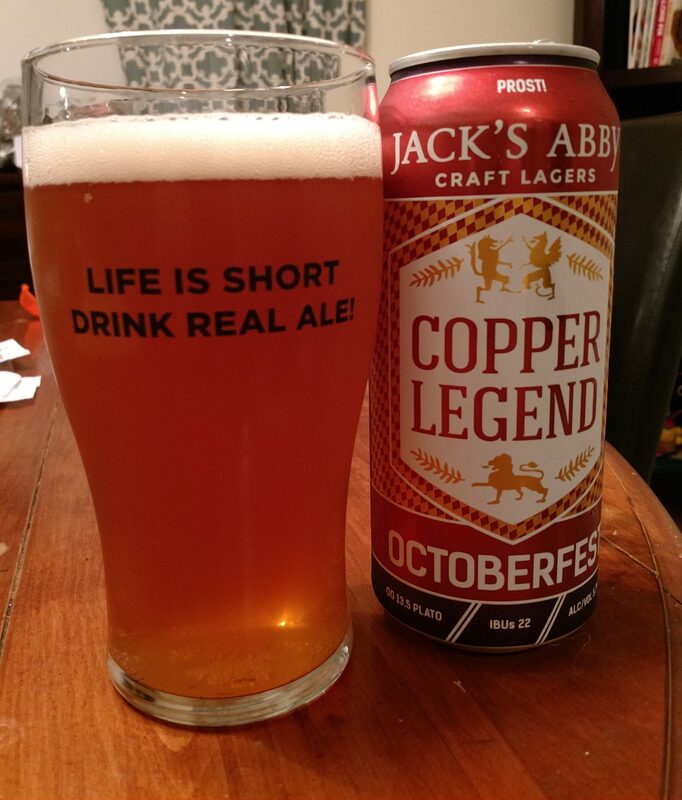 My wife and I recently celebrated our copper (7 year) anniversary and one of my gifts was a six-pack of this lovely offering from Jack’s Abby. Description: The brewery’s take on an Octoberfest beer with a name that may or may not have been inspired by a plumber. You can read more here. Came in a six-pack of tallboy cans. Appearance: Poured a cloudy copper body topped off by a fizzy white foam. Smell: Slightly sweet caramel malt and lager yeast. Taste: Faint caramel sweetness mingled with rich bready malts. These flavors tapered off towards the finish as a mild wheaty presence became slightly more pronounced underneath the lingering sweetness. Mouthfeel: Just a tick above medium bodied with perhaps an equally small tick below moderate carbonation. Hype: I had fond memories of this, but there’s not much in the way of hype for this one. Overall: I enjoyed this. I had my first can maybe a day or two after my first Sam Adams Octoberfest of the year and would have to say that I prefer this one. Might be time to make these a fall tradition as well. I picked this up not intending to review it, since I was sure that I must have done so at some point already. Since it turns out that I haven’t, I figured I might as well. As a fan of this beer and its variants for a few years now, I did this more for fun than experimentation. Description: Stylistically similar to all those big imperial stouts I’ve been drinking lately, you can read a bit more about this barrel-aged version of the brewery’s popular Baltic Porter here. My .5 liter bottle was dated 03/07/2017 and cost a reasonable $10 downtown. Appearance: Poured a thick black body topped off by a thick, two-plus finger head that formed without much encouragement. The foam gradually settled down to a thin coating as the beer went on. Smell: Light mix of oats and sweet bourbon. Inviting, but not as strong as I was expecting. Taste: Rich, sweet dark malts upfront set the tone for this beer. Following up on this were hints of vanilla, grainy oats, and an extremely subtle bit of roast. A sweet bourbon presence carried this through to the finish, mixing with oak and vanilla along the way and leaving a pleasant lingering sweet heat at the end of the sip. Mouthfeel: Smooth, thick body with low carbonation. Accentuated the beer perfectly. Hype: This is a very respected beer, but the hype isn’t really what it once was. 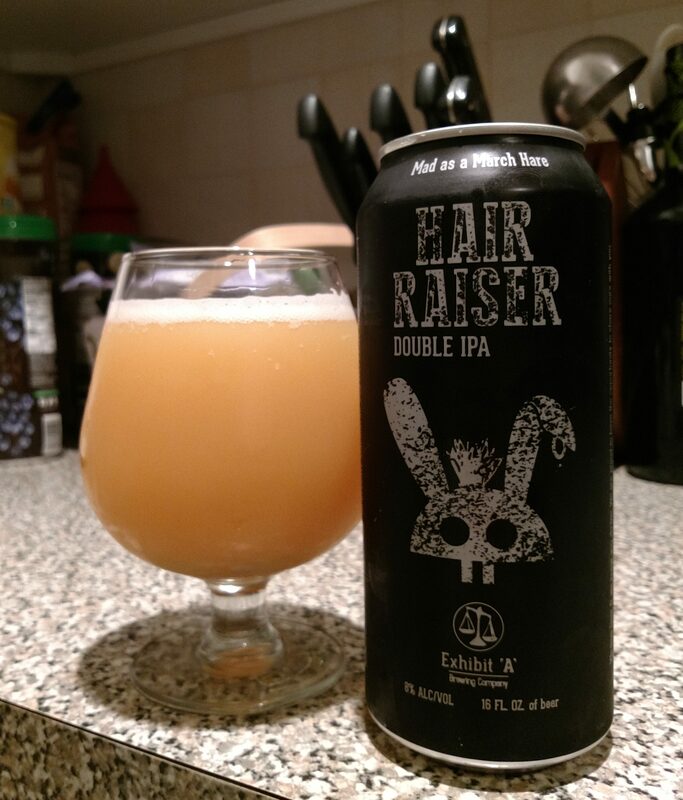 When this first started being released it flew off the shelves, but since then the brewery has ramped their production way up and can better meet demand. Doesn’t make it any less tasty though. Overall: Excellent beer, every bit as good as I remembered. Highly recommended, definitely check this out if you haven’t already. I also highly recommend picking up any of the variants you may find as well.